If you have never attended a Pow Wow or know little about your local tribes, this performance is a must. A unique interactive learning experience that is powerful, moving, and visually stunning. The troupe was founded in 1963 and is the oldest resident Native American dance company in New York. The youngest member is 10 years old. Entering the theatre, the Heyna Second Sons Singers Ensemble performs various selections in a circle beating one large drum. Louis Mofsie (emcee/narrator) introduces each work in the program. One quickly becomes mesmerized with the Robin dance celebrating the arrival of Spring, in which dancers mimic the quick steps of the bird. The Iroquois Smoke dance was originally performed in longhouses. Done in two parts, first by the men then the women. As the men returned to the longhouse they placed a long stick in the middle of the circle of dancers. Each warrior struck the stick down as he bragged about his battles. During the winter, fires were lit in the bark constructed houses to heat it. When there was insufficient ventilation for smoke to rise to the fire hole, women circled around dancing to create a draft lifting the smoke. The Stomp Dance (Oklahoma) was created out of necessity. In the 1800’s the United States government sent Native American children to boarding schools where they were forbidden to speak their own languages or wear traditional dress. Put in uniforms, their hair was cut. Missing family singing and dancing culture, the children sneaked away and invented dances. From many tribes, they could not sing in the same language. They created vocables – sounds put to rhythms that can be learned quickly. Eventually English words were added. Storytelling by Matoaka Little Eagle explained how the rainbow crow lost its brilliant colors. Snow had been imagined by the creator but the animal people were not prepared to survive in it. In an effort to save them, rainbow crow brought fire from the creator to earth. In the process she burned herself, was covered in soot, and was rewarded by the creator with beautiful, shiny black feathers. The exciting evening and program goes by quickly. It is a wealth of knowledge and information. Did you know only men can wear feathers? Special to the 44th annual show is the premiere of “Silent Echoes of Time.” This piece combines traditional and modern music and dance. It is a tribute to veterans and experiences of one member of the ensemble who served in the Vietnam conflict. He begins with a traditional dance. When reminded of the war, another dancer appears as his spirit self and brings to life the battles. In the end they make peace with each other, rise and begin their journey anew. The audience also enjoyed the Eagle, Jingle Dress, Grass, Round, Deer, Fancy, and Hoop dances. Provocative. Stunning. Each presents a tapestry that preserves history and tradition through symbolism and the intimacy of performance. You need to attend to get the skinny on the rest of the program. All proceeds benefit the Native American Scholarship Fund. 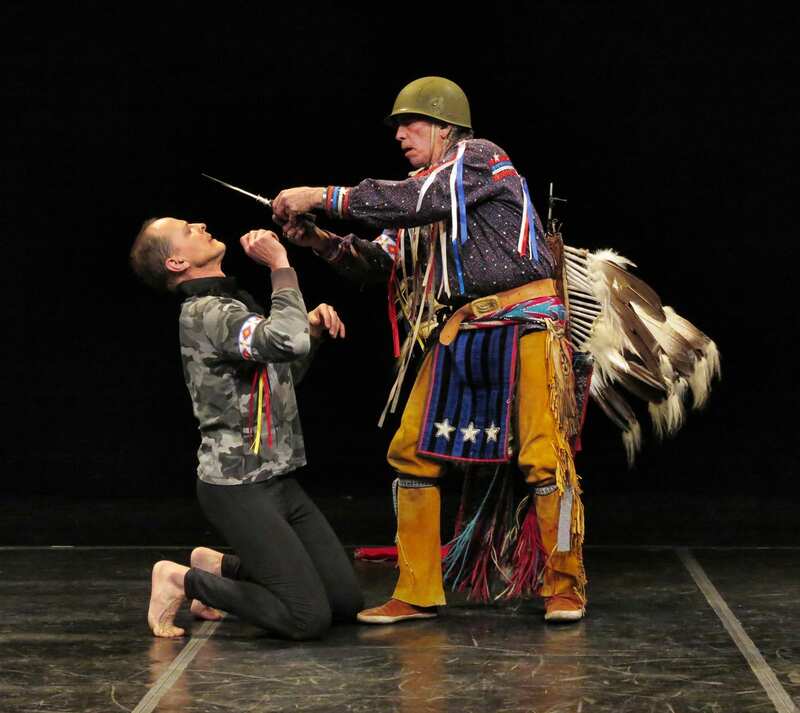 (R) Alan Shooting Star (Lenape) and (L) Michael Taylor-Dancing Wolf (Choctaw/French) in “Silent Echoes of Time,”Photo by Jonathan Slaff. 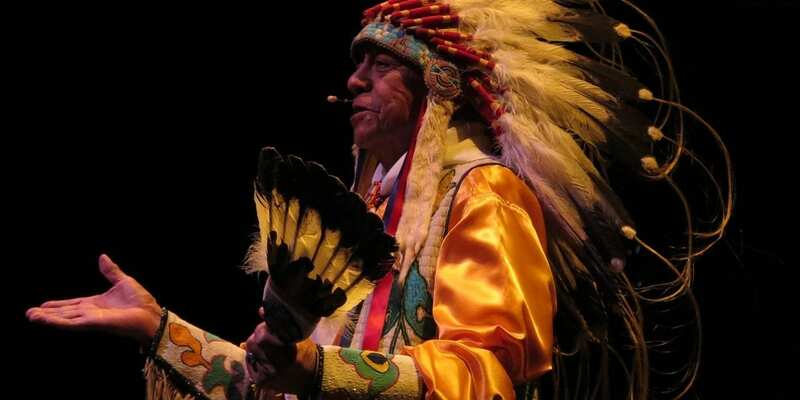 44th Annual Thunderbird American Indian Dancers’ Dance Concert & Pow Wow – Narrated by Louis Mofsie (Hopi/Winnebago). 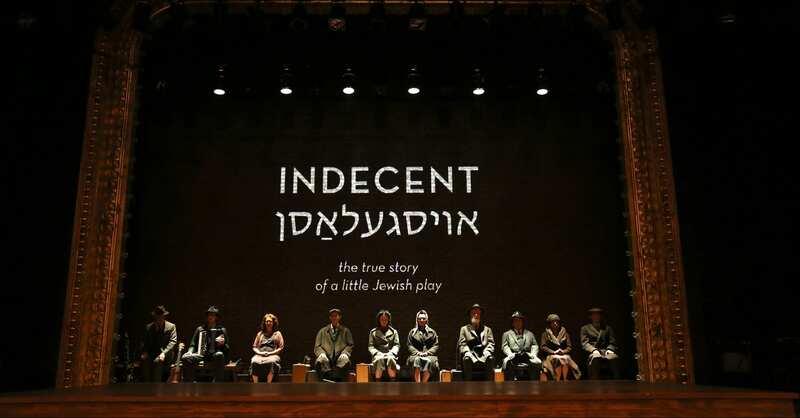 Director, Crystal Field; stage manager, Dawn Hartop; choreography, Michael Taylor- Dancing Wolf; lighting design, Alex Bartenieff; lighting operation, Rob Mastrianni, Dawn Hartop; company house manager, Solomon Mendelsohn; company assistants, Joy Felsenthal-Mendelsohn, John Pavin; artistic director, Louis Molfsie. At the Theater for New City, 155 First Avenue, NY NY 10003; (212)254-1109, www.theaterforthenewcity.net, Instagram Theaterforthenewcity, Twitter @TNCinNYC. Through February 3. Tickets $15 adult, children ages five to twelve accompanied by a ticket bearing adult $1. Saturday 8pm; 3pm Sunday Matinee. Running time: 90 minutes no intermission.